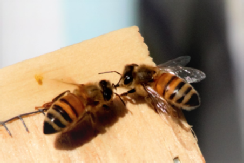 Beekeeping helps the environment immensely as bees pollinate flowers, vegetables, trees, bushes, shrubs, and most any plant that has pollen or nectar associated with it. The beekeepers who belong to Haywood County Beekeepers Chapter in Waynesville, North Carolina know all too well about the hard work and financial sacrifice that goes into beekeeping. But then, any hobby or business costs money, and most do not help the environment. Take a journey through some Apiaries and see what all the “buzz” is about and what other beekeepers are doing to help the environment and hopefully, have an enjoyable time and make some money selling bees and/or honey. One final word of caution before you “buzz” these hives, beekeeping can be addictive in a sweet way. Yeah… let’s rest awhile then fly over and see what’s buzzing at the HCBC hive, during their next meeting or event.